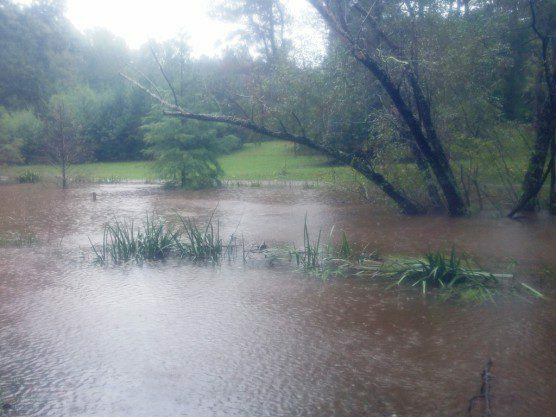 Last weekend, South Carolina experienced a “Thousand Year Flood,” as a low pressure system held in place by Hurricane Joaquin dumped over two feet of water in many parts of the state. We are grateful that we did not experience the same level of damage as some of our fellow South Carolinians, especially those in Columbia, where dam breakages contributed to the chaos; our hearts go out to those whose homes were destroyed in the deluge. Thankfully, all our gibbons and staff came through the extreme weather event unharmed. The rain gauge topped out at 5 inches by 10:00 AM. Last Saturday was not a fun day to be an IPPL animal caregiver, though. Samantha and Ben were on duty. They at first let out the residents of Gibbon Houses #6-#9, but after about an hour (once they realized how much rain we were really going to get), they put the gibbons back inside. Our iris pond doubled in size. That’s not the routine, but Sam said the gibbons were not that eager to stay outside. “Let’s go!” she hollered at them, and in they went! Even Thai agreed to go indoors early, and he’s one of the few IPPL gibbons who doesn’t mind sitting out in the rain. Although our gibbons generally prefer to be outdoors, most of them will at least seek some shelter in their lookout towers when the weather turns bad. Little lakes formed next to the gibbon houses. Poor Sam and Ben. 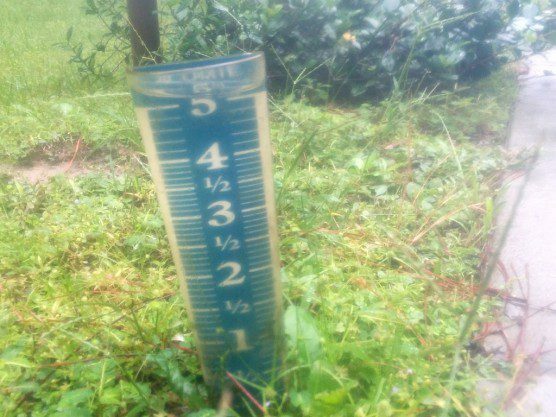 The rain gauge topped out at 5 inches by 10:00 AM. They squelched through their feedings and other chores as the rain came in over the tops of their boots. They came inside every half hour to throw their socks and hoodies in the dryer. They stayed together, since the high humidity made the walkie-talkie reception a bit iffy and the rain was so heavy at times they could hardly see across the property. They squelched across the grass, sinking ankle-deep in mud as the mole tunnels collapsed under their feet. They waded through calf-deep water beside some of the gibbon enclosures. The walkways around the sanctuary turned into streams. 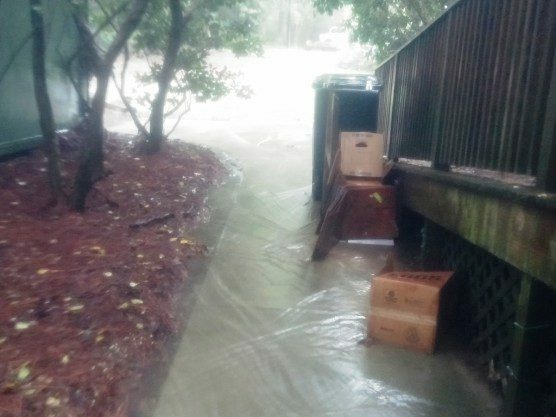 The rain was nonstop, sluicing across walkways and gibbon enclosures. Our iris pond at least doubled in size. Sam and Ben made impromptu drainage ditches through the piles of wet leaves against our western perimeter fence to encourage the water to drain away toward the forested low ground nearby. But at least the gibbons stayed warm and dry. “Tree guys” came and removed waterlogged, dead branches over our main parking lot. 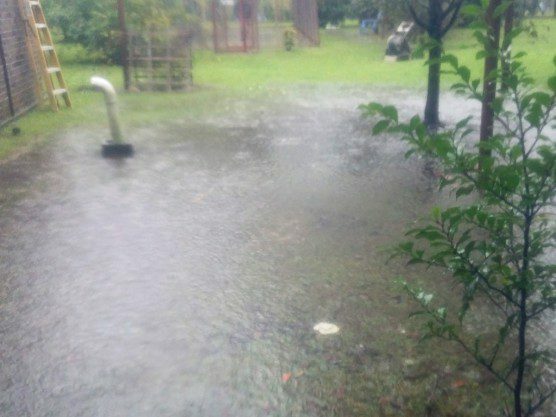 The rains left us with waterlogged tree limbs and a backed up septic tank. 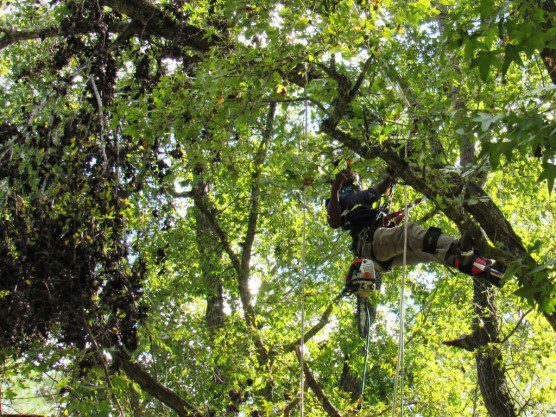 Yesterday we had some “tree guys” come out and remove dead branches from the sweetgum trees by the parking lot; some tree limbs were dangling and threatening to crash down on staff vehicles. We also had the “septic guys” come out and remove a blockage that had resulted from excess rainwater saturating the septic system’s drainage field. It’s hard to predict what else may be in store as floodwaters from the upstate make their way to the coastal areas in the coming days. 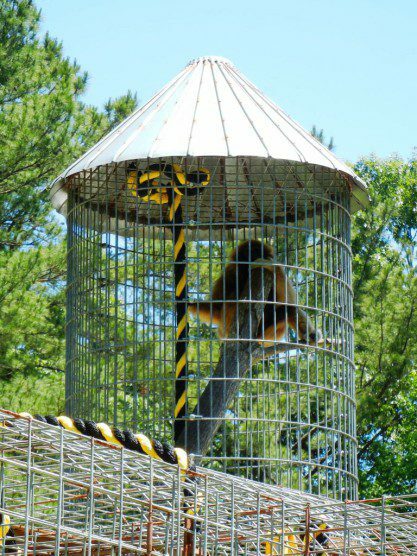 Our gibbons love their lookout towers! Fortunately, our gibbons instinctively know how to stay above it all!